Heat oven to 425°F. Spray 4 (2-cup) individual ovenproof bowls with cooking spray; place bowls in 15x10x1-inch pan. In 12-inch nonstick skillet or Dutch oven, cook beef and onion over medium-high heat, stirring frequently, until beef is thoroughly cooked; drain. Stir in potatoes, mixed vegetables, tomatoes, gravy and pepper. Reduce heat to medium-low; cover and cook 8 to 10 minutes, stirring occasionally, until potatoes are almost tender. Meanwhile, remove crust from pouch; place flat on work surface. With 5-inch round cutter, cut 4 rounds from crust. Spoon beef mixture evenly into bowls. Place crusts over beef mixture; seal to edges of bowls. Cut slits in several places in each crust. Brush crusts with egg white; sprinkle with parsley. Bake 30 to 35 minutes or until crusts are golden brown. 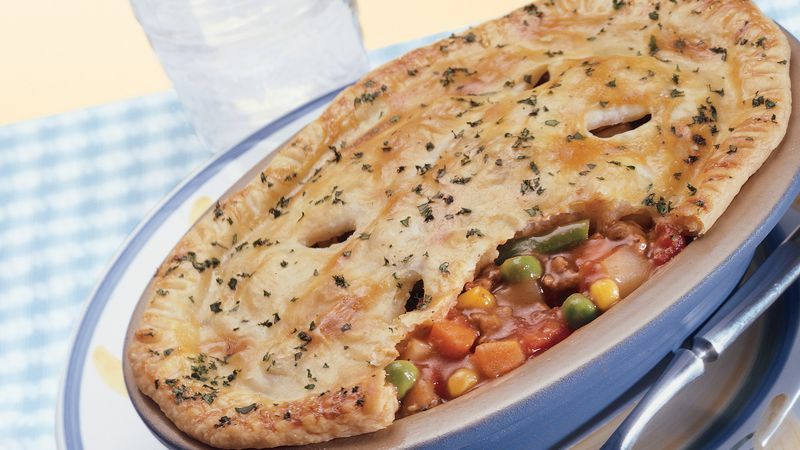 To make one large pot pie, spoon beef mixture into greased 2-quart casserole. Cover mixture with uncut pie crust; seal edge against inside of casserole. Cut slits in several places in crust. Brush crust with egg white; sprinkle with parsley. Bake 30 to 35 minutes or until crust is golden brown.